Estate Planning Client Strategies - Farrell Fritz, P.C. Louis Vlahos has recently been published in the book, Inside the Minds: Estate Planning Client Strategies. 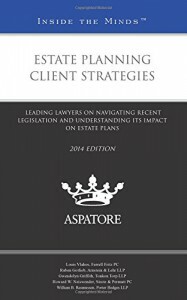 The book provides insider perspective from leading lawyers on navigating recent legislation and understanding its impact on estate plans. After reading his posts on the Tax Law for Closely-Held Business Blog, Thomson Reuters reached out to Lou and asked if he would contribute to the book. His chapter, The Continued Role of Gifting Following the American Taxpayer Relief Act of 2012, is the first of five chapters. For further information or to purchase the book, click here.